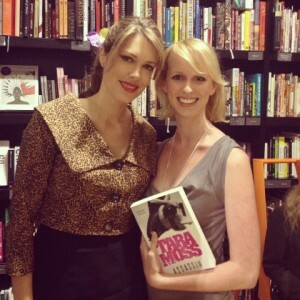 Earlier this week I went to a talk given by Tara Moss as part of the Sydney Art Gallery’s “We Used to Talk about Love” series. The talk was really interesting, and Moss was able to provide some fascinating insight into femininity and crime from her experience as a writer and researcher of criminology. Accordingly when I knew that Moss was going to be giving a talk, I grabbed my bestie and headed on down to the gallery. I was looking forward to the chance to meet someone who inspired me so much, and maybe even ask her for a few writing tips. However, once I was in line to have my book signed, I was set upon by a nervous attack of the giggles. I did not know what was happening to me, but the normally confident twenty-something version of myself seemed to have vacated the building at the end of the talk, and left a 14 year old in her place to wait in line for the book signing. This was compounded by the fact that my friend and I always manage to wind each other up at the best of times. So here we were, two otherwise intelligent, (mostly) sophisticated young women, giggling like school-girls in line at a book signing. I somehow managed to get it together by the time I got to the front of the line but was so concerned I would lose it again that I managed a quick hello, grabbed a photo and dashed out of there. After leaving, I chastised myself for not being cooler. I guess I should have been grateful for the fact that I didn’t go in for an inappropriate hug. Discussing this with my friend afterwards, we decided that what we experienced was a similar feeling to wanting someone to like you as a teenager. You suddenly become nervous, overanalyse conversations in your head and run the risk of sounding like Natalie from Love Actually. It is not like I wanted to impress Moss; I merely wanted to present a good version of myself as I was meeting someone I admired. But instead of offering something intelligent, I was on the verge of coming across like a young girl at a One Direction concert. 1. Remain calm – Yes it is exciting and slightly nerve wracking to meet a role model, however you do not want your general enthusiasm to be misinterpreted as inappropriate fan-girling as this is exhausting, and you might want to be able to say something more than ‘oh my god’ repeatedly. 2. Have something planned to say – At the risk of sounding like terrible dating advice, it is helpful to have something planned to say. If you are meeting an executive from your office, it would be very useful to remember what project you are currently working on, so when they ask you ‘What are you working on?’ you can reply with something more pay-worthy than ‘Um…’ Comments like ‘I like your hair’ are not necessarily the best way to showcase your skills. 3. Be confident – While I recognise this is at times easier said than done, just relax. Remind yourself why you are there and that you are a competent and intelligent person.